August is coming to an end and ODM would like to remind you that it is necessary to plan for your Christmas or New Year promotions in advance. If you haven’t come up with any good ideas yet, we have something for you. 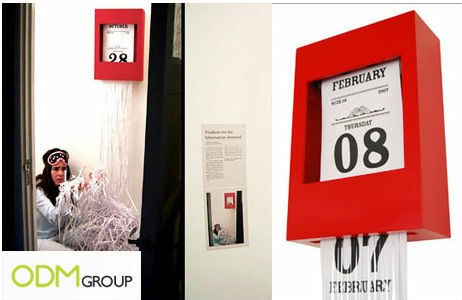 Let us introduce to you some creative calender ideas that you can adopt! Who said calendars should only be printed on paper? Why not try printing it on… balloons! A great idea – especially if kids are your target audience! Furthermore, it can be a form of decoration for your home or office – a very unique and original idea! Want a calendar for the kitchen? Need to save space? Then a magnet calendar is perfect for you! The following calendar works like a lucky draw ticket; you are sure to win something ranging from a joke or a quote, everyday! Just scratch off the silver layer and ‘redeem’ your free gift. If you have your logo printed under the scratch-able layer, it can definitely help with brand recall! The picture below shows a perpetual calendar; one that can always be reused. Just imagine the possibility of enhancing brand recognition… forever. The dates are printed on Post-It notes, so all you have to do is just to arrange them accordingly! Thinking of something more high-end? Then have a look at this shredder-calendar. With this promo item, you won’t have to care about tearing off the date for each day because the shredder-calendar does it automatically! And another funny option for those who think that popping some bubble wrap is the best relaxation ever. Enjoy this procedure every day with this pop-it calendar!